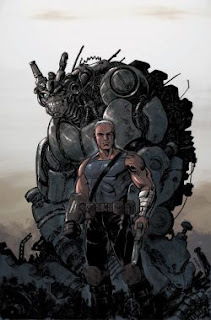 The Fellowship was fortunate enough to obtain a copy of PLANETOID #1 from Image Comics. Ken Garing writes and draws. Silas has seen a lot in his time, and it’s made him tough and resourceful. But now he’s crashed on an unknown planetoid in alien space. And apparently he’s not the only one. He’s keen to escape from the planetoid, but the others don’t seem to think that’s possible. If this issue is any indicator, it’s going to take Silas a long time to get off this rock. It also shows us a little about Silas, and about the planetoid as well. Silas is alone for the first half of the issue, so the artwork gets to tell a lot of the story. And it does so very well; it’s a desolate junkyard of a world with some dangerous ‘critters’ running around. Add to that the tease of a population (which we’ll meet in #2) and we’ve got a solid foundation for the story. I really like the beginning of this storyline, and I’m looking forward to getting to know Silas and being introduced to some more characters on this world. This could really turn into a fun ride. PLANETOID #1 is available now at your FLCS or by order from imagecomics.com.